6.50 points at 12 votes (rank 509). Once upon a time in a peaceful village of dwarves lived Sledgie and Dave. 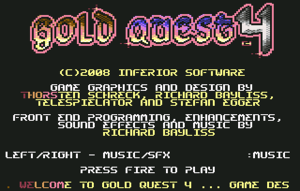 After their three gold quests they decide to relax and play peacefully on their Commodore C64. Suddenly from the back room, they hear a loud scream. Sledgie opens the door of the back room and was shocked to see his girl friend Dworina captured by the evil hobgoblins. Then from out of nowhere came a puff of smoke and the evil sorcerer Petrosilius Zwacklemann appears, accompanied by the mad Hotzenplotz. He takes out his magic wand and turns poor Dworina into a slimy green frog. Petrosilius puts her inside a jar of water, then disappears in a puff of smoke again. The Hotzenplotz also disappeared. Sledgie and Dave were very angry and they decide to set off on their quest, which is to rescue Dworina from the evil Petrosilius. Your first journey is through the deadly village. During your journey by foot, you will encounter some Hobgoblins, enemy dwarves dragons and also bridge traps. However after travelling through the deadly village, your first encounter will be the Hotzenplotz. Defeat him before you can get through the gate out of the village to the forest. After defeating the Hotzenplotz, you decide to take a short cut through the dark forest of spirits. It may sound good for Sledgies, but not really clever. Especially because that tale has been told that the spirits wake up in the night and they don't like characters taking a walk through the forest. Also tale has it that the Hotzenplotz has had a friend that has been setting traps around the forest. After getting through the forest, you will encounter a roaming tiger that will have to be defeated before entering the mineshaft. The tiger is defeated, but unfortunately for you, you seem lost. You seem to ignore the Keep Out sign above the mineshaft entrance, and walk in. Oh dear. Now you have to climb through the mine shaft, to find your way to the lake. The mine shaft is not all that safe because there are dragons, moving mine carts, and also pickaxe throwing miners. Before you can exit the mine shaft you will have to defeat the evil spider. After you run out of the mines you approach the castle, in which is level 4 (Last level). You finally find yourself in the castle. You enter the castle, where the evil Sorcerer, Petrosilius Zwacklemann will wait. Before you can face the evil sorcerer, you have to fight against various deadly creatures from the previous levels. Now you face Petrosilius, who turned your beloved, Dworina into a frog. All you need to do is defeat him so you can break his spell. Get to the dungeon and free her. The game scrolls -as typical for SEUCK- from bottom to top. Although it was programmed with the help of SEUCK, there are many additional refinements: flowing water in rivers, a title screen and music. In the "SCACOM Version" there was a highscore saver built in. The design for the rest is okay, the levels are diversified. The sprites are partly rather cute and well animated. In other words: the maximum was taken out of SEUCK and realized. Collect gold and diamonds to boost your score as every 10,000 points will give an extra life. Gold gives your 1,000 points and diamonds give you 2,000 points. Watch out for deadly traps, especially on the bridges of levels 1 and 2. There are also skull traps that are on level 4. All those trap require good timing. If you get your timing right, you will be safe, else those traps will get you. Shoot everything that shoots back and find safe paths. It is only your safest route for survival. Warning! Some of the enemies require MORE than just one shot before they are defeated. Try to uncover the hidden code, by loading the game (not run it) then home the cursor and type in a 4 character code then RUN the game (it will then decrunch). Here is a clue: it is sometimes black, red, blue or green and is flat. That is all I can say. If you get the code correct, you will be rewarded with infinite lives for both players. If you have played all 4 levels, you will rescue the beloved of Sledgie. But you can also play the game over and over again endlessly, as you can jump from the 4th level back to the first. There are cheats hidden in the game. Robotron2084: "Oh, a new SEUCK product! Hooray! *hag-ridden applause*. Respecting all the effort, which all the persons involved have put into the creation of this work, I would like to be allowed to ask, why they have invested all their energy into the very limited boundaries that SEUCK sets. Despite all the welcome love for details, the final product proved to be awfully cheap, predictable and therefore mind-numbing. Creative energy, that would have been at least 100 times better placed in an independent project and therefore seems almost as superfluent as a hole in the head. 4 out of 10 points." mombasajoe: "I think I can answer the question of the previous speaker "why they invested all their energy": it was probably a lot of fun for them. Something like that is supposed to exist. And "why they invested their energy into the very limited boundaries that SEUCK sets" ... I suppose, if my previous speaker would program a more powerful engine, the authors would surely love to test it and if applicable use it. However, I have to admit, that I am not really a friend of this game. Some sprites are taken from the forerunner, there is the feeling that the game contains more old than new elements. Some animations appear stiff, very stiff, some enemies involuntarily funny (e.g. the split "mummy sheep"). On the contrary I liked Loren and the balance of the game elements. Independently, the game is not really bad, as a fourth part of the saga everything else but exciting. I have absolutely no relation to this game concerning the content and design, but as I was asked to put in a highscore list which I liked doing, I want to forbear from giving a "countable" vote." 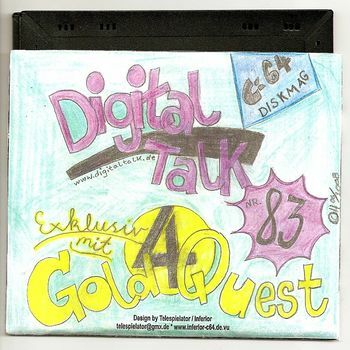 Gold Quest 4 was included in the Digital Talk #83. Please have a look at www.digitaltalk.de. Also, you can download this game from the “Friends and Contributors” page on Richard Bayliss' TND web site. A better version with changes was issued in the English SCACOM PDF-magazine. Also there were SCACOM-exclusive texts and interviews in this issue. Also there is a different cover design (see next chapter). 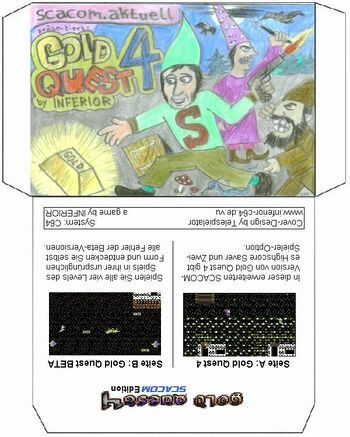 There is a "Gold Quest 4 BETA" in the SCACOM version. You can play exclusively all four levels in its first beta stage. Explore all the mistakes and be a beta tester. Recently there is a competition in the Digital Talk. The one who hands in the highest score in the rescue of Dworina and a picture to prove it, will win one of the limited editions of Trilogy of the dwarfs . Furthermore there are several special prices. Details can be found in the DigitalTalk #83. 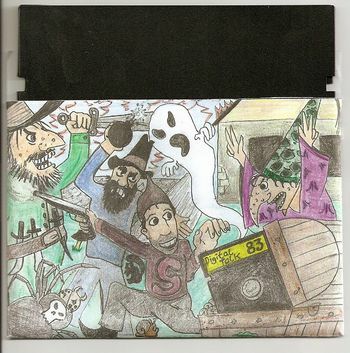 CZ-Tunes published his third remix of Gold Quest - Saga. All remixes of him was published on MyOwnMusic. This page was last modified on 1 January 2015, at 16:52.